Shuei-Liong Lin graduated from Taipei Medical School and National Taiwan University in Taipei, Taiwan. Dr. Lin joined the faculty at National Taiwan University in 2003. Now he is an Assistant Professor at the Medical School, National Taiwan University, and Visiting Staff at the National Taiwan University Hospital. He joined Duffield Lab as a research fellow in 2006 August, and came back to Taiwan in 2008 August. Dr. Lin is a recipient of the Best Research Award of Professor Wan-Yu Chen Fund from Taiwan Society of Nephrology in 2003 and Taiwan Merit Scholarships Program from National Science Council from 2006 to 2008. Most of his fund is from National Science Council, Taiwan. In past 5 years his research focused on the antifibrotic effect of pentoxifylline in kidney, the role of pericyte-endothelial cell cross-talk in kidney fibrosis and vascular rarefaction, the role of innate immune response cells, monocytes, in injury and repair, and the role of Wnt signaling in kidney repair. 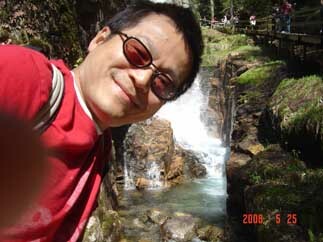 In his ‘spare’ time he climbs mountains, swims, assembles Gundam with his kids, and learns playing piano from his kids.